As the final days of summer come to a close, we start to wax nostalgic about long car trips from yesteryear. Sadly, the children of today -- hooked into their pads, phones and other devices -- will little understand the joys of being packed in the un-air-conditioned back seat with various siblings and/or cousins for 5+ hours with nothing to do but look outside and get on each other's nerves. Of course, desperate parents came up with all manner of games -- license plate bingo, the alphabet game, twenty questions -- to try and keep the peace and a little bit of their own sanity. But truth be told, these were but stop gaps for the real games -- punch buggy and perdiddle -- which provide legally sanctioned channels for punching your sisters. While rules vary (the strip perdiddle game variant cited in Wikipedia is particular unnerving for family road trips), the basic rule is the first person who sees a "punch buggy" (a VW beetle) OR a "perdiddle" (a car with one burnt out headlight) "wins"; you now have tacit permission (according to the international charter of kid rules) to punch someone . Over the years as multiple people stare blankly as I shout perdiddle, it has become apparent that these games (like most human culture) have lumpy spatial patterns, as is evidenced in our map of references to these games in geotagged tweets below . Using Twitter as a proxy for the preference for these road trip games, it is clear that "perdiddle" is mostly a midwestern to east coast phenomenon, with Ohio, Pennsylvania and Massachusetts being particularly prominent. While punch buggy had a greater overall number of references in our data (3612 total tweets, as compared to 1327 for perdiddle), it seems to be more spatially dispersed across the United States, with a somewhat greater prevalence in the west, and the west coast in particular. Perhaps because this is the natural habitat for VW Beetles? We're curious if this distribution fits with your experience, so let us know. Of course, you might get in trouble with your parents but that's another issue. 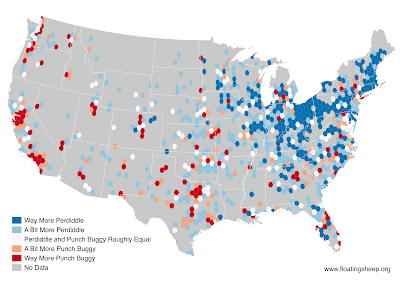 We ran searches for (1) padiddle OR pediddle OR perdiddle OR kadiddle, and (2) "punch buggy" OR "slug bug" for tweets sent from 2012 to 2015, aggregated them into hexbins and calculated a simple odds ratio to compare the two. This is basically the same approach we've done for awhile, so no need to rehash the details here. If you'd like to see more on this methodology, check out our forthcoming book chapter.